I chose a sketch from Crafting Life's Little Pieces. I wanted to do something that would feel spring-like or summery so decided that the "Green and Gold/Yellow" in the challenge at Emerald Faerie Garden would work really well, and besides, green-on-yellowgreen or green & gold fits in with my favorite color combos. I chose a green that was more of an avocado but I still like the end result. Mostly I chose that particular shade of green because of the dp I used. It's one of my all time favorites and I have only a small scrap of it left. I've horded it and used it sparingly for fear I'd run out and now that's exactly what's happened. It's been long discontinued, having come from a stack of scrapbooking paper which must be more than 3 years old at this point. I haven't seen it anywhere in such a long time. :-( My second inspiration for colors came from the photo at For Your Inspiration, filled with trees and bushes glorious in greens, golds, and yellows, -- mmmm, luscious! I colored Margaret with watercolor pencils and added a glint of sparkle to her glasses and lips with sparkle gel pen. I used two different baker's twine, wrapped them around the card front and tied a bow, then added the gold star charm (metal). The circles on the corners are done with a hand punch from two different colors of CS, layered onto each other. 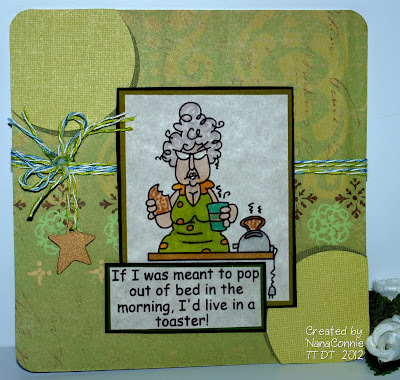 I wanted to maintain a CAS feel to this card because Margaret just isn't a fussy, fluffy, frou-frou kind of gal. She's pretty plain and outspoken, in a what-you-see-is-what-you-get kind of way. 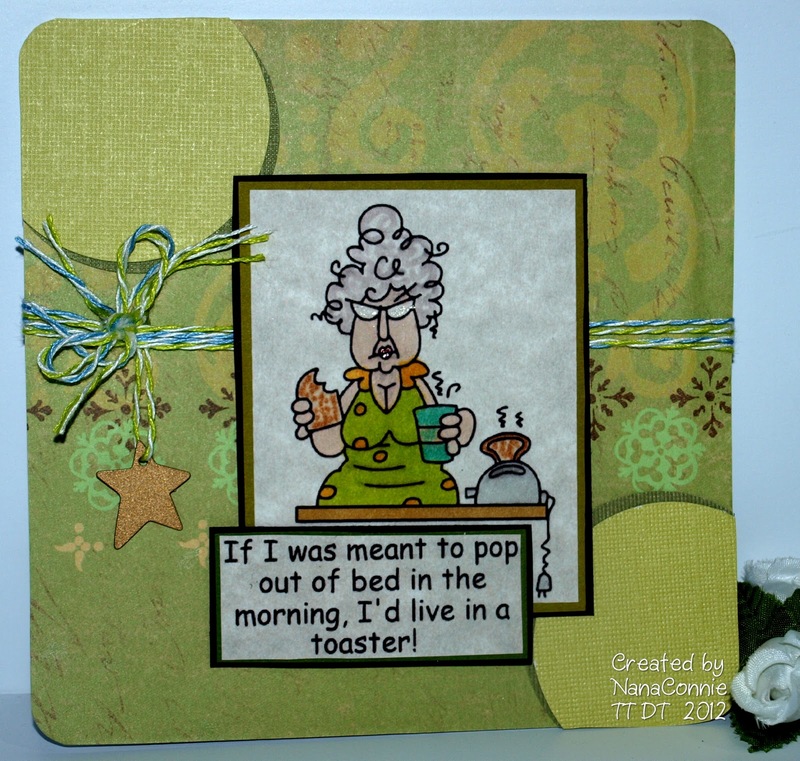 No fancy lace or pleated ribbon or piles of flowers for her! Here's the sketch, but I turned it on it's side. I colored the image with ProMarkers (Passion for ProMarkers -- Humor), and added the computer-printed sentiment, modifying the digi slightly to make it work. The digi is from a new set called "Cheer Up" and only the question mark is actually in the "text balloon." I adhered my sentiment next to the question mark and then made the balloon surround the entire thing. 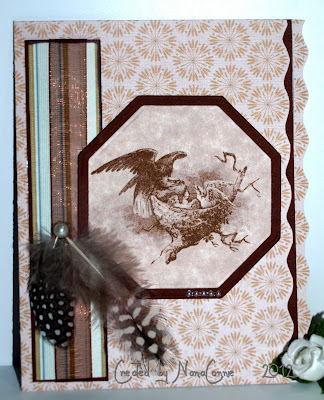 Papers are from DCWV (I think -- they've been in my stash for a while), and the twine is the only embellishment. 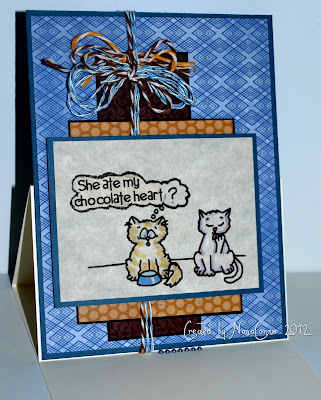 I tied big loopy bows from blue and brown twine (with one gold) and added them to the blue and brown twine wrapped around the card front before attaching it to the easel. I'm fairly new at doing easel cards, and this is the first one I've done with an A2 style card which is folded on the 4 1/4" side. So, new image and new technique. Did you know last Tuesday (January 10) was national Save the Eagle day? Neither did I until I read about it over at Outlawz. 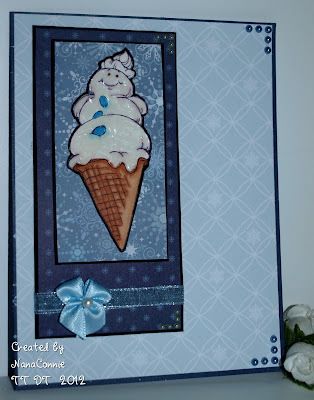 I can't enter this card in their challenge because that's a color challenge (and I didn't use those colors) but I have to give credit to them for the inspiration to use a feather or two on a card. Sketch from Fetch a Sketch. This is another of those vintage images which seem to have me hooked lately, printed onto parchment paper, then die cut with one of my new die sets (hexagon), and matted with chocolate CS, cut one size larger. 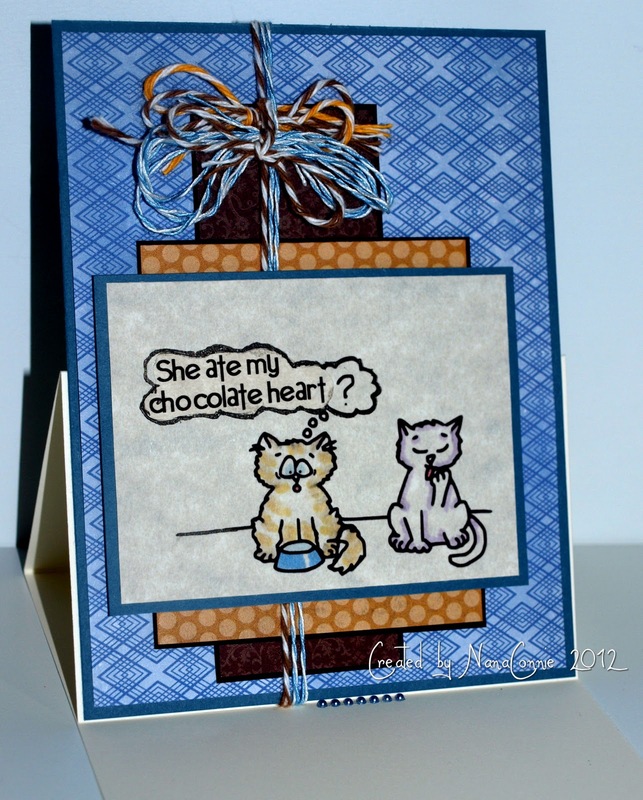 I cut the background dp with scissors (after adhering it to the card front - cut all the way through the card), turned the cut off piece and adhered it to the back edge of the card. Then I added a strip of brown CS to set off the wavy front edge and complement the wavy back edge. The striped dp is another piece from that same dp mat stack, Linen Closet - DCWV, matted with brown CS and wrapped with sheer brown ribbon. I added the feathers (no, those aren't eagle feathers!) and punched a hole for the pearl brad before mounting the strip onto the card front. Pearls were added to the image panel and then it was mounted last. TIP: Here's a tip for getting feathers adhered to a card without having them glued down the entire length of the feather. I scraped the tip of the "feather stem" with a craft knife to flatten it as much as possible, then put down a tiny drop of craft glue right where the feathers were to go. Before adding the feathers, I punched a tiny hole for the brad right next to the glue spot. Then, I added the feather tips to the glue spot, and put the brad in place. The brad overlaps the feather tips and holds everything in place while the glue dries. It's also securely glued in place. The eagle feeding new chicks is so symbolic of New Beginnings and certainly has lots to do with saving the eagles. Without offspring, there will be no eagles left to save. I used a sketch from My Time Made Easy. Doesn't this snowman cone look ready for a party? He could be Christmas or New Year, or even a birthday, as long as he gets to the party! 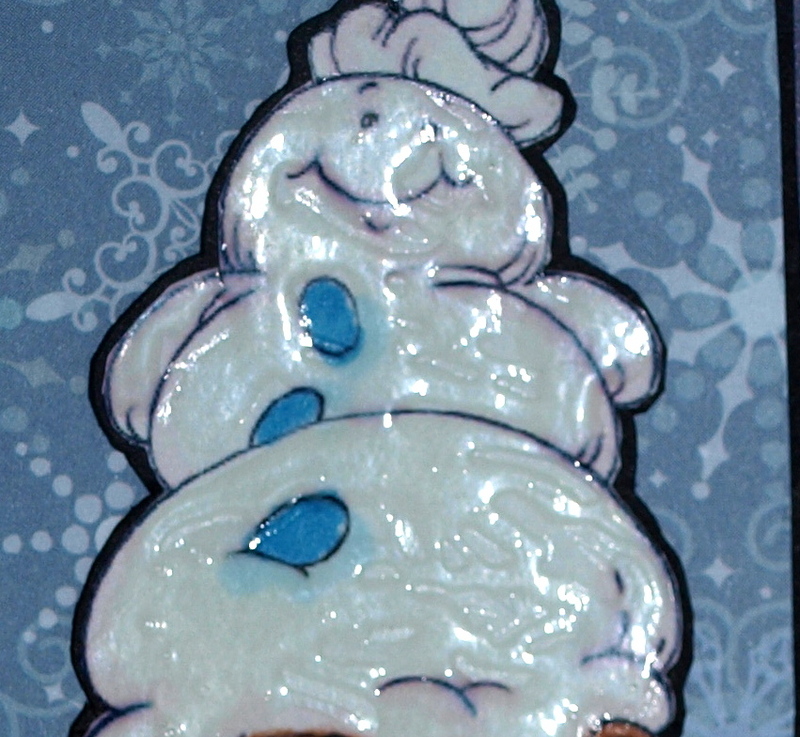 Ice Cream (the snowman kind or not) seems to always be a necessity for parties and celebrations of all kinds! The dp came from the new DCWV stack which Santa brought me for Christmas. Love all the snowflakes in those papers! I fussy cut the image and matted it with black CS. Each dp is also matted with black. I added the ribbon, the bow, and the shiny pearls as embellishments, all from my stash.